EZBlocker for Android is no longer maintained and may not work on all devices. EZBlocker is now available for Android (no root required)! Get the same seamless experience as EZBlocker for Windows 7/8 on your phone or tablet! 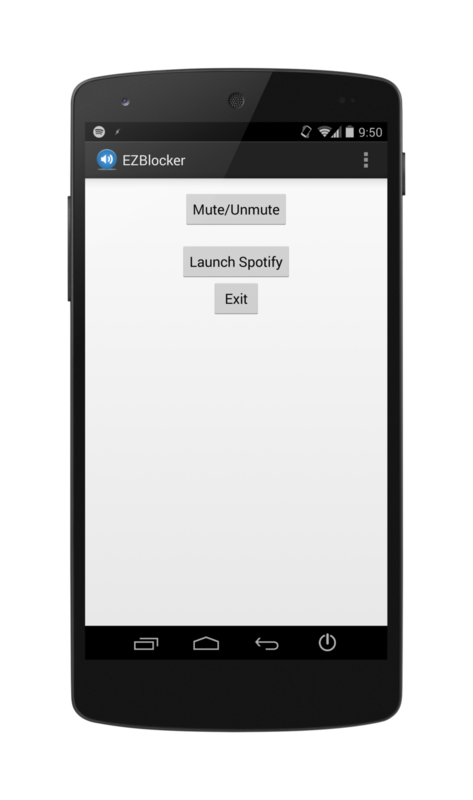 EZBlocker for Android will automatically mute your Spotify advertisements on Android versions 2.2+. 1. Download EZBlockerAndroid from your phone/tablet (link below). 2. Install the EZBlocker apk file. You may need to enable “Unknown Sources”. 3. Open your Android Settings, then “Accessibility”, and enable EZBlocker. 1. Press the “Launch Spotify” button in EZBlocker and start playing your music. 2. Close out of Spotify (ie., go to your home screen or any other application). The Spotify notification icon must be visible for EZBlocker to work. 3. Enjoy your music without listening to annoying ads! It is recommended to use the Spotify home screen widget. Why aren’t ads being muted? Did you enable EZBlocker in your Accessibility settings? Also make sure you don’t have Spotify in the foreground. EZBlocker only activates when the Spotify icon is visible in the notification bar. Read the installation and usage instructions above. In rare cases, some ads may slip through EZBlocker’s filter. Leave a comment below if this happens. Will EZBlocker slow my phone down or drain the battery? Probably not. EZBlocker takes minimal RAM and CPU usage and only runs when Spotify is active. It’s footprint is roughly ~20% that of Spotify’s. Newer devices will not notice a difference. Is EZBlocker for Android open source? It will be eventually. Right now, EZBlocker for Android is still in its testing phases, so the code is pretty messy and undocumented. There is no “Block” button dude. If you mean the “Mute” button, it’s supposed to be used manually when an ad slips through. If you enabled the “Accesibility” for the app (read instructions above), you don’t have to do anything more for EZBlocker to work after you start it. EZBlocker crashes evrytime when trying to do any action on spotify, that requires prerium, IG. changing/skiping songs. For everyone that is still having probably due to annoying ads till eric zhang fixes it which haven’t seen happing sadly go and search for modders who cracked the application. example “spotify cracked apk” can’t provide links since I think that the owner of the site wouldn’t be too happy if i did so .